Smartwatches are infinitely fascinating. For one, their growth is incredible. This time last year, we had Samsung's overpriced Gear, Pebble, and a Sony timepiece or two. Now we have Android Wear and a dozen options to choose from, and possibly the biggest game changer will be revealed in 48 hours. On Friday, Intel and Fossil announced a partnership that spells out future collaboration on wearable (i.e. smartwatch) devices. For Intel, this isn't too shocking as this mimics their recent decision to team up with SMS Audio on their upcoming biometric earbud. During that SMS Audio press announcement, Intel's New Devices VP Mike Bell said that " we know what we know." Meaning when it comes to hardware design, it's best to leave it to folks who know what they're doing. And for a chip company, that makes perfect sense. Chip competitor Qualcomm tried to strike out on its own with its concept Toq smartwatch, meeting an overall lukewarm reception. Now, it's seems even Qualcomm might be getting cozy with Timex. So what does this all mean exactly for smartwatches and for those of us who still desperately want to own one? The thing to keep in mind is that smartwatches are not smartphones. From an objective standpoint, that much is clear, but also from a development standpoint. When smartphones came around, the manufacturers making them were the obvious experts, mainly because smartphones had never existed in the first place. In fact, cellphones (and eventually smartphones) partially convinced us that we could ditch wristwatches entirely. You have the time right in your pocket! Now those very same companies want us to think the exact opposite, and where in 2007 Samsung, Apple, and others were defining the physical design of smartphones with every passing iteration, watches as a form factor have been perfected over the last 150 years. Companies like Rolex, Tag Heuer, Swatch, and Fossil know what watch wearers want and that information could be valuable to tech companies. Smartwatches themselves may slowly begin to look less and less like painfully obvious wrist computers, and some of those very designs may come from traditional watchmakers. Already we're seeing smartwatches move beyond the proof-of-concept phase into a hardware refinement phase. LG's G Watch R boldly suggests to improve on the Moto 360's design and is even fashioned to look like a normal watch with second markers etched around the screen. Huawei called out Samsung promising its upcoming smartwatch will look "more beautiful" than the Gear S. Apple is inviting fashion editors to its iPhone/iWatch reveal on Tuesday and hired industrial design guru Marc Newson, who also has watch design experience. And that was just last week. It wouldn't be such a huge logical leap to see more hardware-focused companies, like Samsung, HTC, and LG, start to team up with traditional watchmakers. After all, LG has reached out to companies, such as Prada, for design help and Samsung's also worked with Swarovski to supply some of its more lavish pieces of tech jewelry. This doesn't mean partnering up will be a universal truth. Apple will mostly likely keep all design decisions in Cupertino, some watchmakers may resist smartwatches entirely, and others, like Swatch, may try to strike out on their own. 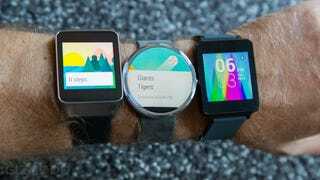 Either way, smartwatches will continue to get better and better with each passing model. Right now, the biggest barrier is the market's breakneck refresh cycle. It's difficult to decide what smartwatch to commit to as more and more are announced, and with Apple's iWatch on the horizon, that speed won't be slowing.